If you look at the picture of Yuan Taiping it’s hard to believe that he is only 30 years old, but he is. Since the age of 21 he has experienced what appears to be rapid aging and doctors are at a loss to explain how or why this is occurring. Stranger still is the fact that his full head of black hair remains unchanged. 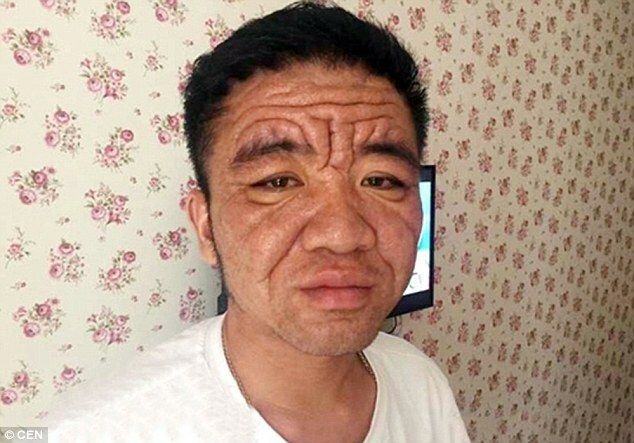 When his symptoms first appeared he experienced swelling of the feet and hands and as the strange ailment progressed he began to develop wrinkles on his face equivalent to someone much older in years. Complicating his illness are the effects on his daily life. 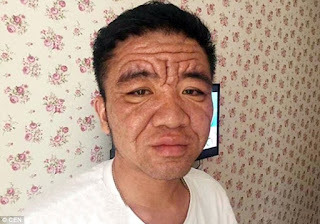 More than once he has been denied withdrawing money from his bank because his physical appearance is so different from his ID. Often people make disparaging remarks to his wife and question why she is married to a much older man. Yuan also suffers from extreme fatigue making his position with a construction company almost impossible for him to continue. As if all of this is not baffling enough, other people that live in both his village as well as the neighboring village are also beginning to show the beginning stages of this unknown ailment. In addition, no other member of his family has reported similar health problems in the past. This would seem to indicate that heredity does not play a role but perhaps something environmental is responsible for this newly discovered illness. Regardless of the exact cause Chinese authorities have good reason to be concerned. Without understanding why this is occurring to people that are otherwise young and in good physical condition it is impossible to predict if or how quickly the illness could spread.